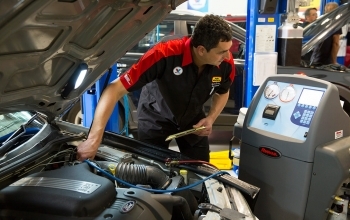 At Auto Masters, a service is more than a few new spark plugs and an oil change. We have one of the industry’s most comprehensive checklists to make sure your car is running smoothly and safely. Plus, it means we can pick up any minor problems before they become big, expensive ones. For a fixed price up front, a 100% money-back guarantee and service you can rely on, book now at your local Auto Masters branch. A Little Bit Of Old Fashioned Service! Call into any one of our branches and we would be happy to check your oil and water for free. It’s important to check these levels on a regular basis and it’s often forgotten when we are filling up the car with fuel..
No replacement parts, oil, coolant, etc are included in this free offer. Auto Masters reserves the right not to check water level if vehicle exhibits signs of overheating and the Auto Masters technician fears a chance of injury. Auto Masters understands the inconvenience of breaking down. In the unfortunate event that you do break down and require towing, please contact Auto Masters during business hours and we will organise for your car to be towed to our closest branch for free. To qualify for the free tow, your vehicle must display an Auto Masters pledge sticker at the time of breakdown and tow. Valid only in the metropolitan area or within a 10km radius of any regional branch. The free tow service is exclusive for a mechanical repair or failure only. Our goods and services come with guarantees that cannot be excluded under the Australian Consumer Law (“ACL”). You are entitled to a replacement or refund for a major failure and compensation for any other reasonably foreseeable loss or damage. You are also entitled to have the goods repaired or replaced if the goods fail to be of acceptable quality and the failure does not amount to a major failure. In addition to the rights and remedies to which you may be entitled under the ACL, we provide an extended warranty in relation to Tune and Services, Mechanical Work and in respect of Brakes (“the Extended Warranty”). Under the Extended Warranty you will be entitled to the following benefits. Please click here for full details. At Auto Masters, our commitment is to efficiently serve motorists with service beyond their expectations. Using the highest quality products on the market, supplied by reputable brands with a long history in research and development and more importantly, the back-up and support required to handle any customer issues. Do you have a mobile car mechanic service? No, unfortunately we do not offer a mobile car mechanic service, this is because we want to ensure your car is serviced correctly by having the relevant tools and hoist at our disposal. Simply book your car service at one of our local branches today, or we offer a free tow service if you’ve broken down and can’t get to your nearest branch. Do you offer a pre purchase car inspection service and report? Yes, all vehicle inspections are carried out by our experienced car mechanics who will provide you with a comprehensive report on the general mechanical condition and car safety components of any vehicle.